The current topic is Merlin. This is an interactive group where input is welcome. Each session is 2 hours long and includes a tea break. Monday 15th April: tying up some loose ends from the Arthurian legends, continuing with information on the character of Merlin. New members are always welcome, so if you are interested, please contact the Leader. 1/. Completed looking at Chretien de Troyes French Romances (Romance is an old version of the French language). He produced five Arthurian Romances. He was influenced by the earlier writers and stories and was under aristocratic patronage rather than working in an ecclesiastical environment so could write a different type of book and add his own details. He was the first to link Queen Guinevere and Lancelot. The storytelling in ‘Lancelot or the Knight of the Cart’ employs the rules of courtly love with the female being revered and the male disdained, gallantry, within a deeply Christian context. It starts with some deep flattery to Marie de Champagne his patron. The story covers the abduction of Guinevere and other members of the Camelot Court by Meleagant. Lancelot who is Guinevere’s champion sets off to rescue her. Along the way he is subject to many trials, temptations and tribulations. Not all goes well and he suffers conflict and soul searching which at times is at odds with his courtly love ideals. He hesitates to get into the cart as it is a very low status means of transport linked to the crusades and to losers but he should only have been thinking about Guinevere. There are suggestions of the other world. 2/. ‘Vulgate Cycle’ was written just under 100 years after Chretien works. It is a reworking of the French Romances by Cistercian monks sometime between 1230 and 1250. The church had wealth and political power and had their own agenda; they rejected the questionable values of courtly love. They used the Arthurian stories as a vehicle to promote an alternative more Christian/spiritual way of living. The stories were transposed from the 6th century to the Middle Ages. Guinevere is used to show the perfidious nature of women, they are sexual, fickle, betraying, and bad tempered; Lancelot is shown as wracked with grief and remorse. As a result of Guinevere’s behaviour and the failings of Lancelot Arthur’s glory fades. 3/. Le Morte DArthur, Sir Thomas Malory c1469/1470. This book was Caxton Press printed so had a much larger potential readership. There is a mystery as to the real identity of Malory he may have been a noble man who went off the rails and wrote the works in prison. He may have been a professional gentleman soldier who was a prisoner of war but there is no evidence he was ever knighted so he would not have been a Sir. Malory read Chretien and the Vulgate cycle and he also knew Geoffrey of Monmouth’s work and the others. He then added in his own bias and influences. Malory lived in the time of the War of the Roses and was afraid the country was going to collapse. Arthur was a strong and resolute king whose power and glory did not last due to unrest within his court. October 2018 – King Arthur building the legend contd. Arthur’s exploits in Gaul where he killed a giant on Mont St Michel, subdued most of Gaul. Arthur set off towards Rome but returned home to fight his nephew Mordred who had seized his crown. Guinevere had broken the vows of her marriage. He defeated Mordred and his 8,000 strong army in a bitter battle. Mordred then retreated to Cornwall. Guinevere gave way to despair and took the vows of a nun. Arthur’s final battle was at the River Camblan in Cornwall. Arthur was mortally wounded and carried to the mystical Isle of Avalon. This happened in 542. He was succeeded by his cousin Constantine, son of Cador, Duke of Cornwall. 2/. Other chroniclers of Arthur based on Geoffrey of Monmouth’s work. Robert Wace – was an Anglo-Norman monk who translated Geoffrey’s History into Norman–French, in verse form c1150. He introduced the idea that Arthur was not dead but would return, added the first written reference to the Round Table and expanded the chivalry and romance side of the tale. He dedicated it to Eleanor of Acquitaine. Layamon – a priest living in Worcester took Robert Wace’s work and translated it into Middle English, in the late 1100s. He added in a boat and two women who take Arthur to Avalon. He was influenced by his own time when it was brutal in Britain, he left out the chivalry side of the story and increased the violence involved and the number of casualties. Chretien de Troyes – based in Troyes at the Court of Marie de Champagne (daughter of Eleanor of Acquitaine) and her husband Henri who were his patrons. He used Geoffrey of Monmouth and Robert Wace as source material along with other French, Breton and Welsh sources. He was not part of the clergy. He expanded the chivalry and romance side of the story. Romances appeared in 12th Century and were popular with the French nobility. These were translated in dozens of languages. He introduced ‘courtly love’ which involved exquisite beauty, morals, nobility, with women worshipped as a goddess by their lovers, platonic in its ideal form, the hero having to show his worth to an outwardly disdainful woman. The ideal did not always prevail in the stories or reality. These translations made the story of Arthur accessible to more people as Geoffrey’s work was originally in Latin. Books were very expensive and were not available to all levels of society. Continued looking at Geoffrey of Monmouth’s “History of the Kings of Britain”. It was only in the Middle Ages that the story of Arthur started to take off. Geoffrey of Monmouth wrote the “History of the Kings of Britain” c 1136. He was a well read clergyman. He would have been familiar with early sources and welsh folklore and poetry. He wrote it as an interesting read with added colour. The west is Britons, the east was colonised by the Saxons amongst others. The time at which it was written would have had an influence. For example the references to the combat style and jousting were relevant to 12th Century not the time Arthur is supposed to have lived. Arthur was a Christian waging war on pagan Saxons, which reflects Geoffrey of Monmouth’s beliefs. There were massive Saxon casualties, in the many thousands. No evidence of such huge losses has been found. One of the old sources he used was Nennius’s battle list for Arthur. This list was covered in our March session. He changed the order of battles, combined and added to it. Perhaps he had other sources for which we no longer have a record or made things up. He reports military campaigns involving thousands of men, travelling great distances. In one case an army 183,000 going to Gaul. He conquered Iceland and Norway. The result is a rollicking tale reminiscent of the Celtic warrior hero. Making a start on Geoffrey of Monmouth’s “History of the Kings of Britain”. In writing his book, Geoffrey used most of the early Welsh sources that we have also covered, plus Welsh folklore and legends that were current in his own time, plus the Classical writers for his Roman history, plus his own imagination. He produced a very entertaining mixture of probable history at one end of the scale, through myths and legends, to pure fantasy at the other. He wanted to tell the story of the history of Britain from a British (i.e. Celtic or Welsh) point of view, so the Saxons get a very bad press throughout. He starts with the first inhabitants of Britain (a race of giants) and then brings in Brutus, the grandson of Prince Aeneas of Troy, who kills off the giants and takes control of the land. Brutus is followed by a series of British kings who are all portrayed as great personalities, with Arthur as the greatest of them all. Geoffrey is the first writer to link Merlin with the Arthurian material, and he also introduces Uther Pendragon and Igerna as Arthur’s parents, and Arthur’s conception at Tintagel. It is thought that Geoffrey may have found the story of Uther and Igerna in a Cornish legend that has now been lost, but the Tintagel connection would seem to have been his own invention. According to Geoffrey, Arthur began his campaigns against the Saxons as the King of the Britons and sole commander of the British army. His first objective was to attack the Saxons in York, to seize loot from them, with which he could reward his own men. He was entitled to do this because he had a rightful claim to the kingship of the whole island of Britain and all that it contained. A number of theories which support the argument that an historical Arthur did exist. Arthur was a late C5th/early C6th Romano British war leader from the Celtic Gododdin people who fought the Picts and Scots in the north and later moved south west to fight the Saxons. Arthur was the grandson of the Gododdin Chieftan Cunedda. He migrated from the north sometime in the C5th and had his HQ at the old Roman town of Wroxeter. Arthur being a nickname meaning bear. Arthur was associated with the Kingdom of Dumnonia in the south west. This Arthur took an army from Britain into Gaul to fight the Visigoths on the behalf of Rome. Arthur was a Gododdin war leader based in the north who fought the Picts, Scots, Angles, Saxons and the British kingdom of Strathclyde, had a one off battle in the south at Badon and the battle of Camlann was located at the western end of Hadrian’s wall. Arthur’s name was Lucius Artorius Castus a Roman general who is recorded as commanding a troop of Sarmatian mercenaries. These were from the Russian Steppe Lands, north of the Black Sea. This theory has the dates as much earlier than the others at around 175 AD. Arthur was a king of the Alan peoples who originated from the Eurasian Steppes (Scythia). Mid C5th he moved his people to Armorica (Brittany) where he fought rebellious Celtic tribes on the behalf of Rome. The C5th ‘Life of Germanus’ records a meeting between Eothar and the Bishop Germanus. We also looked at what it would mean if he was not real and was always a mythological figure. He may have started as a god/warrior hero and been given a human persona. This has happened before as we have seen in the Celtic Warrior hero tradition. The story of Arthur as well as being popular in Britain also exists in Northern France, Germany and Continental Europe. He appears in Grail Myths. Where might the myth have come from? Possible European connections are shown in theories 4, 6 and 7. For example Arthur is in the myths and legends of the Alan people. In Scythian legends Nart Saga Tales there is a mythical figure called Batraz. His mother was a frog by day and beautiful woman by night, he grew at a phenomenal rate, he had a magic sword, killed a giant, had a chalice of truth. Wounded in his final battle he cast his sword into the sea and the legend is that he is not gone. There is a lot of information available on the internet by using simple searches on the writers’ names or the topic. Some books are still in print others are available second hand. The continuation of our search for references to King Arthur in the early Welsh source material. In the Welsh battle poem “Y Gododdin”( attributed to the poet Aneirin and composed sometime in the early 600s) it is said of one Gododdin warrior that ” He glutted black ravens on the walls of the fort/ Although he was not Arthur”. In the “Elegy of Gereint” (author unknown) that describes the Battle of Llongborth, we have “At Llongborth I saw Arthur, an emperor commanding the battle”. We have no way of knowing if these one line references to Arthur were there in the original C7th versions of the poems, or if they were added in later copies, when Arthur had become a well-known figure in folklore. In the “Spoils of Annwyn”, the poet Taliesin (late C6th) gives us a tale of Arthur and his companions conducting a raid on Annwyn, the Realm of the Dead in the Otherworld, to steal the Cauldron of Plenty (cf Cuchulainn who does much the same thing). This is Arthur in the context of Celtic warrior hero mythology, rather than telling us anything about Arthur as a possible historical figure. looking at the early Welsh “Saints’ Lives” that were written by monks at Llancarfan in Glamorgan, in the C12th (although the saints in question lived c500AD), so again a large time difference between when the events happened and when they were actually put in a written record. Arthur is mentioned in the Lives of St Cadoc, St Carranog, St Gildas and St Illtud, in largely unflattering terms, and in encounters in which the saint gets the better of the pagan and unruly warrior. This may have been subject to bias on the behalf of the recorders. March 2018 – King Arthur is there evidence he existed contd. A summary of the previous session where we discussed the suggestion he was a British or Romano leader from the north. There was not a lot of evidence for his existence, no mention of him in the 540’s documents by Gildas nor by the Venerable Bede in 730ish. The earliest mention is 800-900 AD (around 400 years later than he is thought to have existed) in the British Miscellany – the Welsh Annals mention Arthur being the victor at the battle of Badon 518 AD and his final defeat at the Battle of Camlann in 539 AD. Nennius wrote in Latin circa 800 AD. He compiled data and did not try to interpret it, just to collect it. As a result there is often more than one account of things and we do not need to worry about his bias. This gives us a lot of data. In Nennius’s the ‘History of the Britons’ he covers a lot of the information discussed in the previous session. He refers to Arthur as Dux Bellorum, a war leader not a king, that could have been why Gildas did not include him in his reporting as he was only a warrior. Nennius says it as a fact and lists 12 battles in which Arthur took part and won. He treats him as an historical figure but also as a folklore hero. The written evidence is still not there and it is thought likely that Nennius found his information for the battles in an old Welsh poem of which there is no remaining evidence. If this is true there is a theory that Arthur was alive when it was created which would place it prior to his defeat at the Battle of Camlann which is not mentioned. We looked at the 12 battles referring to information from ‘Arthur’s Britain’ Penguin, London 1971 by, Leslie Alcock who tried to reconstruct the campaign. The possible sites for the battles were greatly geographically spread which would have meant a lot of travel and did not make military sense and there were time order issues. There was no consensus on locations and for the first eleven battles the evidence is speculative. There seems to be very little if any residual evidence for Arthur’s battles. There is more evidence for the twelfth battle The Battle of Badon. The Battle of Badon is likely to be in the south given it took place between the Britons and Saxons but this still had five possible locations. The final battle at Camlann is not mentioned by Nennius but this is covered in the Welsh Annals. There is considerable debate over the location of Camlann. Next month we shall consider some slightly later documents written in Latin then onto the mythology of Arthur. February 2018 – King Arthur is there evidence he existed? The historical context and where he would fit in to what is known of the people, social and political structures and the geographical location of people and tribes of the time. There are no surviving early written references to Arthur at a time when the Romans and others kept good records. When looking at historical records it is important to consider what influences there may be on the writer and their interpretation of events. There are myths and legends of King Arthur and his followers in Europe as well as Britain. Traders, warriors, settlers, entertainers etc. moved freely around the west coast of Britain in the time period. There is an oral tradition of a great warrior hero in the centuries after 500AD which originated in the North of England and down the West Coast 5th C onwards. Stories of Arthur and resistance appear 960 onwards, 400 years after he may have lived. There was a discussion on two written references to Arthur in the British Historical Miscellany Welsh Annals. The first was to the Battle of Badon in 518 AD and the second to the strife of Camlann in 539 AD which is a long time period after the battle Badon. Some sources put the battle of Camlann even later which would mean a very long time frame of 21+ plus years between the two battles. The Miscellany is probably dated c960-970 AD so is from over 400 years after the events recorded. The consensus is it at least records an early tradition of a warrior called Arthur at the Battle of Badon. At the next session we shall look at Nennius and the History of the Britons. Culchulainn’s links to the supernatural and the gods. Tales of him show his ability to move between one world and another, so showing god-like characteristics. Some tales show him to be descended from the sun god and there are references in the Phantom Chariot to him sailing west for many days. The three tales in the session covered some common recurring themes and references as such as birds which feature in Celtic mythology. Bird migration was explained by them moving to the other world and they are seen as messengers and emissaries for the gods. Green is the colour of the gods. Water being the delineation between this world and the supernatural, so tales are based on lakes, trips to islands, the magical properties of fords. The Wasting Sickness of Cuchulainn, this appears in a manuscript of the book of the Dun Cow from 1100’s which covered a story from oral form from long before it was written down. It takes place at Samhain a magical time of year. Whilst feasting 2 beautiful birds linked by a red/gold chain sing and all who hear it are lulled to sleep. Cuchulainn awakes and goes to hunt the birds. They turn into women who whip him until he is nearly dead and leave. He stayed in bed for a year and then awoke and told his story and goes back to where he was whipped. The story goes on to involve Fand, the most beautiful woman in the world and abandoned wife a of Manannan Mac Lir the sea god, who wants Cuchulainn and then does not and the story is finally resolved with a drink of forgetfulness so he and Emer (his wife) can go on again as if nothing had happened. The Phantom Chariot, a story which involves the other world and enchantment and many of the common themes. It is an epic tale of a raid on a mysterious island where they encounter all manner of mystical beasts which Cuchulainn overcomes eventually coming home with gold. There were signs and portents and the Druids tried to keep Culculainn away. His horse the Grey of Macha refused to be bridled and cried tears of blood. Three old women cooking a hound on wooden spits invited Culculainn to eat with them. He was honour bound to do so despite the hound being his totem animal. This caused serious damage to his strength and fighting ability with half his body paralysed. He saw his enemies and asked three druids for the three spears he had with him. These were Medb’s men and they gave them to him by hurling them at him, fatally wounding him and killing Laegh Mac Riangabra his faithful charioteer. He died after tying himself to a stone pillar so he could die standing. With his death the glory of the Red Branch of Ulster passed. More exploits of the Irish Celtic warrior hero Cuchulainn, the greatest hero the world has ever known. This session carried on with the story of the Champion’s Portion. After many trials of their strength and courage, Cuchulainn won the contest and claimed the Champion’s Portion. Consistently, Cuchulainn showed greater strength and courage than the other two warriors, Laoghaire and Conall. However the crucial thing was that he was also an honourable man. He kept his word and stayed to face another giant, when the other two turned tail and ran. That was what made Cuchulainn a true champion. Cuchulainn was called Setanta when he was born and given the warrior name of Cuchulainn when he was nearly seven years old after he killed a guard hound in self-defence and replaced the hound by defending its owner’s property until a new one was trained. The hound was owned by a smith called Culann, Cuchulainn means ‘The Hound of Culann’. The wooing of Emer – Emer was the daughter of Forgall of Leinster and was the most beautiful woman in Ireland. Cuchulainn wanted Emer and she set him some trials to win her hand. It was during these trials he travelled to Skye with the aid of a magical wheel provided by his father Lugh the Celtic sun god. In Skye he trained with Scathach a great female warrior and became an accomplished warrior and gained Gae Bolga a barbed spear which would split into 30 barbs. It was also here he had the prophesy that he would live three and thirty years and die at the peak of his glory. Eventually Emer was his. Throughout there was a discussion on how he met the list of attributes of the hero. The Champion’s Portion – We started this rollicking and entertaining tale of the Champion’s Portion. Bricriu was a Chieftain of Ulster who built the finest house in a year and a day and invited warriors Cuchulainn, Laoghaire and Conall Caernach, amongst others to a magnificent feast with the intention to cause discord. Though they were wary and set conditions Bricriu managed to set seeds of dissension as the tale progressed. The Champion’s Portion was a fabulous part of the banquet which would be given to the best warrior. Bricriu told each of the three warriors they would have it and should send their charioteers to claim the portion as theirs. The ensuing fight is described in detail with hyperbole, and continues until it is realised that Bricriu had a hand in the proceedings. Bricriu then spoke in turn to Fidelma the wife of Laoghaire, Lendar the wife of Conall and Emer setting in motion another chain of events which involved unseemly sprinting and the near destruction and restoration of Bricriu’s new house. This provided the storyteller with more opportunities to illustrate Cuchulainn’s strength and skills. The exploits of the Irish Celtic warrior hero Conall Caernach, including the story of the Boar of Mac Dathro, in which Conall got the better of the Connacht champion Caet Mag Macha. There was also a discussion on the part hero/part fertility god aspects of Conall’s character, and the suggestion that he started his mythological career as a god, who was given a warrior hero persona over time, as his story was told and retold. Started a new hero called Cuchulainn and discussed his unusual origins and childhood – tradition of a triple birth with a human mother and the sky god as his father, setting out for Emhain Macha to begin his warrior training when he was just five years old. The cattle raid of Cooley involving Queen Medb of Connacht, her consort Aillil, a young Cuculainn, Ferghus Mac Rioch, Cormac and Conall Caernach. There are recurring themes of betrayal, loyalty and honour. Symbolism such as running water at a ford which is linked to magic, wizards could not cross, a crossing point from this world to the other world, so was an access point for gods. The tale uses exaggeration to entertain the audience and for example to show how great a warrior Cuculainn was. As at November 2017, this is available on the internet. In addition there is a wealth of information on the stories and characters on the internet. June was away, this was a free group session. A discussion driven by selecting heroes, this covered Beowulf, King Arthur/Lancelot and Robin Hood, and tying up their characteristics with the list provided. It was interesting to see how many different legends had evolved around each one. It was a short high level session and it was suggested that these heroes could be discussed further in future. 2/. The hero is superhuman, not like ordinary men. He has superhuman strength, daring, courage, beauty. The hero also has unusual origins that mark him out as special from birth (e.g. mixed god/human parentage). 3/. The hero is not just a macho man. He is cultured as well. He does not always depend on strength and courage alone; he can use cunning and brain power to get himself out of trouble. 4/. The hero is usually courteous, kind and fair in his dealings with anyone who plays fair with him. But whenever he encounters rudeness or unwarranted aggression, or meanness, or cowardice, he will give as good as he gets. 5/. For the hero fairness, honour, reputation, loyalty, are all-important, and must be safeguarded. If a hero loses honour, or his reputation he has lost everything. The hero follows the warrior code of conduct. He fights strictly according to the rules, and respects his opponents, because his own honour and reputations as a warrior depend on doing just that. 6/. The hero has a restless spirit. He is not content to settle for the limitations of human existence. He longs for adventure and goes to find it. He tries to fight against his own mortality, and to do great deeds so that his name at least will live forever. 7/. The hero often dies a tragic and/or untimely death. He espouses the idea of a brief life filled with glory, again so that his name will live on after he is gone. 8/. Through his career, the hero often has help from the gods, but this help is not unconditional. I he offends the gods, they will turn against him. 9/. The hero is very likely to offend the gods, because he has failings. He knows the rules, and the importance of following the rules, but he does not always do it. The hero can be rash, devious, mean-minded, boastful, ungrateful, overbearing, foolish, arrogant. Worst of all perhaps, so far as the gods are concerned, he can get above himself and forget that while he is superhuman, he is not yet as god. When the hero steps out of line, one or more of the gods, or Fate, will intervene to bring him back to earth. A recap of some of the information about hero Conor Mac Nessa – the mythological King of Ulster. Conor possessed all the most desirable qualities in a king- skilled warrior and wise and fair in his judgements, but there was also another less positive side to his character. The legend of Deirdre and the Sons of Uisnech. In this legend there was a beautiful girl called Deirdre, a nurse, a Druid, Conor Mac Nessa, a young handsome warrior called Naoise who was one of the sons if Uisnech and a prophecy concerning the future of Ulster. All did not end well for Ulster via a very complicated narrative involving duty, symbolism, betrayal, and conflicting and unresolvable loyalties. There were a large cast of characters including Ferghus Mas Rioch a Red Branch champion who was a complex character of prodigious appetites but a strong moral code. It was suggested in earlier mythology that he was a fertility god who then morphed into a warrior hero. Ferghus is also featured in the epic tale of the Cattle Raid of Cooley along with Queen Medb of Connacht. These myths are very early, for example The Book of the Dun Cow was written in the 12th century using language seen in the 8th century. As at September 2017, these are available on the internet. The introduction of the topic – Heroes from Celtic myths & legends with some general information on the aristocratic warrior society that forms the background to the Hero myths. Characteristics of the mythological hero – a warrior, handsome, brave, strong, skilled fighter, superhuman with unusual origins, strong sense of honour and loyalty and playing by the rules, a restless spirit, a close relationship with the gods, and help from the gods in his career. Alongside all the positives, we also noted that the mythological hero was not perfect, he had failings which often led to his downfall. Hero Conor Mac Nessa – the mythological King of Ulster. Conor possessed all the most desirable qualities in a king- skilled warrior and wise and fair in his judgements, but there was also another less positive side to his character, as in the legend of Deirdre and the Sons of Uisnech, which will covered in the next session. June was away this session so the group did some research and had a discussion. Maya – This starts with a watery void with grandfather and grandmother deities. These deities gave birth to twin brothers one of whom was known as the Maize God who married and fathered two sons. Following a ball game the twins were summoned to the underworld where after a series of trials they were sacrificed. The Maize God’s severed head magically impregnated the daughter of an underworld god who gave birth to another set of twin brothers who were called the Hero Twins. The Hero Twins excelled as hunters, ball players and tricksters. They tricked their half-brothers’ turning them into monkey men who were patrons of all the arts. In the Maya myth the creation is an iterative process. The creation is imperfect so the cycle ends and the god tries again. The first beings were made from mud, the second from wood, third is flesh and the fourth is maize dough which is the current cycle. Valleys of the Chibcha – These people lived in the mountain valleys of what is now Colombia to the North of the Inca empire. Their myth starts with darkness then the god Chiminigagua sets the light within him free using a flock of great black birds to disperse it. Later he sets up the sun in the sky and the moon. This god did not make man this was done by a female god Bachue and her son and they procreated and their off-spring populated the world. Inca Creation Myths – These accounts were recorded by priests, from information on pottery, architecture and the legends which survived amongst the native people. The world started as covered in darkness then out of a lake, the modern Lake Titicaca, a god called Con Tiqui Viracocha emerged. More detailed information on this can be found via the Crystalinks site, details in the reference section of this post. Many familiar themes come up. Inca – Chac the god of rain who covered the four corners of the world. Northern Andean Tribes – An all powerful divinity called Sibu who had the power to grow men and animals from seeds. Rubber Ball – A new item is the rubber ball which comes up more than once and is something of an enigma. The rubber ball had associated ball courts where sacrifices and prayers were made. Dark world, water as a source of people, birds, maize, trees and tree of life. The South American myths are bird orientated. There are common creation myth themes such as a great flood. Although the land masses were separate, due to climatic conditions there was a greater uptake of water into ice which lowered the sea levels considerably by around 300 feet. There would have been land bridges which we don’t see today. Changes in climate conditions would have encouraged people to migrate, taking with them their myths and folklore. It is estimated that at one point the human population may have dropped to fewer the 10,000 people. There is a lot of information available online and in books, some of the sources used in the discussion are listed below. World Mythology in Bite-Sized Chunks-M.Daniels-(M.O’Mara Books 2016.) Useful handbook to dip into as reference/guide. Short bibliography & website info. The myths of the people of the First Nations, this was an oral tradition so information was transcribed. In the previous session we covered the Huron and Iroquois myths, they were located north of Lake Erie, around the USA/Canada Border. The Maidu people were located in what is now known as California. If you have access to the internet for browsing there is a web site which covers this legend in detail http://www.firstpeople.us/FP-Html-Legends/TheCreation-Maidu.html, there are other sites available. It starts with a dark water filled world with two ‘persons’ floating on a raft, Turtle and Father-of-the-Secret-Society. The Earth-Initiate came down from the sky onto the raft, his face is never seen but his body shines like the sun. Similar to the Sky Father in other myths. From here the land is created by tiny amounts of mud brought up from the sea bed by Turtle. The Earth-Initiate calls his sister the sun and his brother the moon, he called the stars and they appeared. Humans were made from the red earth. Life is made to be easy but when the Earth-Initiate went back above the Coyote brought hard work. When people die they go to the spirit house in the West. Tuscarora people are one of the 6 nations of the Iroquois from where North Carolina is now. It explains how the Sky Holder made the world and the plants and animals. A long time later he created 6 pairs of humans and told each pair where to live. The Sky Holder took the Tuscaroras further south towards the Roanoke River, and stayed with them and taught them. They were the preferred people as he did not stay with any of the others. Haida people were located along the coast of what is now British Columbia. The Raven is the central figure who created rocks out of the water so he could rest. These became the Queen Charlotte Islands. The Raven made two women from sea shells and only later was a man created by throwing limpet shells at one of the women. These myths have the common themes such as the ocean/water similar to the primeval sea, a mother earth type figure, sky spirits, good/evil. There are similarities between the North America and Australia myths where people are seen to have animal ancestors. Useful Reference – A. W. Reed Aboriginal Myths, Legends and Fables, 1982, Reed New Holland, Sydney, 2000. This can be found by searching on the internet and may be available second hand book shops. Great Spirit Father – this was a belief in the south east of Australia, he was known by a number of names and in the new South Wales he was called Baiame, he was thought, non-corporeal. He shaped the earth and all on it by thought alone. The session looked more deeply at two myths associated with Baiame. Baiame and Marmoo and Baiame and Man. Baiame and Marmoo – how the world created by Baiame was changed by Marmoo the Spirit of Evil and the opposite of all that was good. Baiame and Man – the creation of the world by thought, how day and night were created. The creation of man incorporating the wisdom and majesty of Baiame and the subsequent creation of woman. Great Mother Myth – Most of the myths are male dominated but in some parts of the Northern Territories there is the Great Mother. The Great Mother wandered the Earth in Dreamtime and gave birth to all living things. Diverse Themes – The Ancestor Myths which are very physical and the Spirit Myths are very different. The group discussed how this could come about. It has been suggested ancestor myths are older than the Great Spirit myths and reflect an earlier belief system which was replaced as people became more sophisticated. An alternative view is that the Great Spirit myths were influenced by contact with Europeans/Christians. There is a contra view which is that these were likely to be much older than that as they occur in areas where there was little or no contact such as the outback. Covering the myths of the people of the First Nations. This was an oral tradition. Huron and Iroquois myth. – In 1874 information was recorded from a Huron Chief when he was 70 remembering the traditions from when he was young. A woman fell from the sky and a Great Turtle brought earth from the sea bed to make land for the woman to live on. This grew larger to form a great country which was borne on the back of the Great Turtle. The woman had twins a Bad Brother and a Good Brother. This topic will be completed next session. There are themes which appear in creation mythology which occur in more than one culture. There are theories as to how these myths became common and widespread. Perhaps this was spread by travelling people. They have commonalities with each other which could be explained by similarities in society structure, agricultural environment so could have been used to explain the world. An alternative view is there is something fundamental within humans which lead to a need to explain things so we do not feel totally helpless. It formed a basis for discussion at the session. How would this apply to remote areas of the world such as New Zealand and Australia? The New Zealand myths, these have similarities with other cultures creation myths in that they started from darkness (Te Kore) and had the sky (Ranginui the Sky Father) and earth (Papatuanuku the Earth Mother) which were separated to create a space between them. Then followed explanations for the winds and storms, the stars etc. It is relatively small, with well-connected communities and the myths were relatively uniform across New Zealand and considered learned. Australia is more fragmented. The people were more dispersed, separate and isolated with different languages and dialects, living in very different climates and environments. There are a myriad different myths and legends for creation. They are on a more human scale. Dreamtime and ancestor mythology was widespread. In this time is not linear, the ancestors are still here, transformed, and are part of the world. Sudden events happen. Creation mythology belonging to the Germanic tribes, including the Angles and Saxons who were settling in Britain from c400AD onwards, and there is a familiar pattern of a Sky God who mated with Mother Earth to produce the various elements of the universe. The creation mythology that belonged to the Scandinavian peoples (including the Danes and Norwegians who were moving into Britain from c800 AD onwards) where it is the god Odin who is credited with creating the Earth, the sky, stars, sun, moon, and the first people. It is suggested that Odin started his career as the Germanic god Woden, a god of wind and stormy weather, and also a god of battle and a god of the dead. By 800 AD he had also acquired the attributes of the old Germanic sky god, and emerged as the creator of the universe and the leader of the gods. The Scandinavian creation myths are very dynamic, with an original chaos that is all about two regions of ice and fire that clash together in the Great Void. The first living creatures were a giant called Ymir and a cow called Audumla who feeds the giant with her milk, and Buri & Bor who are the ancestors of the gods, emerge from out of the melting ice. Ymir produces a son, who is the first of the Frost Giants. Bor and the Frost Giantess Bestla produce three sons Odin, Vili and Ve (it is suggested that Vili and Ve are just aspects of Odin, so we would have Odin as the “three in one”). According to Hindu mythology (in the Rig Vega) Varuna, the sky god and the god of water, willed the universe into being. He set out the three worlds- the heavens, the Earth and the air in between the two, and “fixed the waters above the heavens”. Varuna held the heavens above the earth and lets the waters through, little by little, to fall on the earth as rain. Varuna was also responsible for maintaining the “good order” of the universe- he had a continuing responsibility for the universe that he created. In later myths (in the Upanishads) Vishnu replaced Varuna as the creator god. In early Greek myths (Pelasgian myths) the goddess Eurynome was the first entity to emerge from the original Chaos. She created the serpent Ophion, mated with him, then took the form of a dove and laid the Universal Egg. All the elements of the universe hatched out of the egg. Eurynome also gave birth to the gods and goddesses known as the Titans, who were responsible for maintaining order in the new universe and for keeping it safe. In later Mycenaean myths, the goddess Night was courted by the Wind and she laid “a silver egg in the womb of darkness”. The egg hatched and out stepped the deity Eros (not the same character as the later god of love). Eros created the sky, sun, moon and Earth, but it was the goddess who ruled the universe. Other Mycenaean myths, five beings emerged from the original Chaos these were Gaia (Earth), Erebus (Darkness) Nyx (Night), Tartarus (the Abyss) and Eros. These beings created the various elements of the universe. Gaia gave birth to Uranus (the sky god) and then Gaia and Uranus produced the Titans who were to rule the universe and to make sure that good order prevailed. Cronos, the youngest of the Titans, killed his father Uranus and took over as sky god and supreme ruler of the heavens and the earth. Cronos and his sister/wife Rhea then produced the next generation of gods, the Olympian gods- Hestia, Demeter, Hera, Hades, Poseidon and Zeus. Zeus killed his father Cronos and took over from him as the sky god, ruler of the gods, and supreme ruler of the universe. Some Greek myths say that the first humans emerged spontaneously from the earth. According to other myths, the first men were created by the Titan Prometheus from clay and water. The goddess Athene (Zeus’ daughter) breathed life into the figures. The first woman (Pandora) was created by Zeus (or on Zeus’ orders) to cause trouble for Prometheus, with whom Zeus had a running feud. Donald MacKenzie, “Mythology of the Babylonian People”, London, Bracken Books, 1996. Jennifer Westwood & Jacqueline Simpson, “The Lore of the Land: A Guide to England’s Legends”, Penguin, 2005, paperback edition 2006. These can be difficult to find so try your local library which may be able to order them for you or look in second hand bookshops or charity shops. Khum – In addition there is Khnum a creator god who was known all over Eygpt. Common Themes – There are similarities in these beliefs and stories in the Hebrew tradition as recorded in the Old Testament Book of Genesis which has at least 2 accounts of creation, Jewish folklore with Adam and Eve and a tradition that survives in the Koran where Satan takes the form of a serpent to tempt Eve. Why Creation Myths Came about – a discussion around the topic. Location – Near East/Middle East Maps giving an indication for Sumer and Babylonia’s location, roughly where Syria and Iraq are now. Time Line – Approximate dates to give time context. Sumerian and Babylonian Creation Mythology – these are the earliest with surviving physical records. The information based on clay tablets discovered in archeological excavations of temple and palace ruins. These had multiple gods. May Eve – Before 1752, when the Julian Calendar was in place, May Day was later in the year and May blossom was flowering on the day. Hawthorn was special, representative of the earth mother, fertility and goddess and used symbolically at May Eve. May Poles – were saplings, often birch, where most branches were taken off and decorated. These would be set up on the village green and danced around all year. These were very different from the white Victorian ones we have today. The May Queen – Originally had a King. The procession provided a service to bring good luck in return for donations. May Hobby Horses – In Padstow the Obby Oss is one of the last hobby horses, it comprises of a wooden frame resting on the rider’s shoulders, with a fashioned horse’s head. With attendants the Hobby Horse would parade around the town. May Dew – had special curative properties curing consumption and poor sight amongst other, and brought good luck for the year ahead. Midsummer -rituals involved bonfires, these happened all over Europe with torchlight processions. August – the first loaves were baked from the new wheat. Harvest – rituals were pagan, rowdy and unbridled. The church tamed it down and civilised it. The Kern Baby or Corn Dolly preserved spirit of the Goddess of the Corn through the winter. 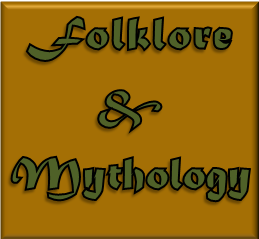 There was a short discussion on Mythology and how it is distinct from Folklore. Mythology is large scale covering fundamentals such as where the universe comes from. Folklore is more domestic. Unfortunately June could not attend the session so the topic was carried forward to May. Eggs. Associated with Spring and new life by many cultures with painted and coloured eggs being given as gifts by the Greeks, Romans, Egyptians, Persians and Chinese in pagan festivals celebrating the return of Spring. Eggs were symbols of Christ’s resurrection for early Christians. Colouring eggs. Colouring eggs is ancient and widespread, with mysterious reasons to decorate eggs with special origins stated. Red being a symbol of life, good luck and fortune. Easter Games. There were lots of games focussed around the Easter period, often involving young men showing off their strength. Easter Eggs were used in games such as egg tossing, egg-shackling, egg rolling. Bonfires. May Day marked the beginning of Summer. There were many ritual bonfires, seen as good luck, symbols of renewal and purifying. All domestic fires would be put out and a bonfire lit by a sacred fire kindled in a special way and then domestic fires would be relit from torches from the bonfire. Fires were lit at other times of the year. A strict process had to be followed, with lots of conditions. Need Fires were lit at times of crisis such as Foot and Mouth. Dressing as animals. Frowned on by the church but ignored by the people. Mummer’s plays. Plays of the people. Based on pagan traditions. Players always dressed in disguise as a form of protection. Yule candle, yule log. To ensure good luck in new year both candle and log must remain lit. New Year First footing and wassailing. First footing ensures good fortune for coming year. Wassailing 12th day farmers toast crop then return to farmhouse for feasting. Monday 18 January 2016: Christmas Festivities and its pre-Christian precursors. There was much symbolism in the use of greenery and decoration from pagan times. Monday 21 December 2015: Halloween and New Year. This included burning the Clavie in Burghead on 11 January, New Year’s Eve in the old calendar. The Clavie was a burning tar and peat filled barrel prepared with much custom and ceremony. It was then carried round the town on the head by some strong male bearers. This was supposed to be for good luck for the year ahead. This tradition is still carried out today. The images below were provided by the Burghead Visitor Centre, the link will take you to the Clavie page. Anyone wanting to read more information on this can read Christina Hole’s ‘A Dictionary of British Folk Customs’, London, Hutchinson & Co., 1976, pp 48-50. Monday 16 November 2015: This was the first meeting of the group. At this session it was decided that the first topic focus would be folklore and traditions associated with festivals & festivities through the year.